I met Jeremiah through a really good friend of mine! Initially when I first quit my job, we were going to take up blogging together. I told him my plans. He told me his. Then he bought a cup to kick start my ideas. After a few months of mulling over ideas for content, I gave up… I didn’t want to think about it anymore, and day after day, I laid in bed until noon because I was somewhat in a depression mode – didn’t feel like I was useful. Then I thought about the cup I had gotten from Jeremiah. It gave me hope, and I didn’t want it to go to waste. So I picked up blogging again, laid out the content I would write for the month of August, and now I’m writing. Jeremiah, thanks for the encouragement to keep going. There are days when you just need a small pick me up, and a good friend can do just that! 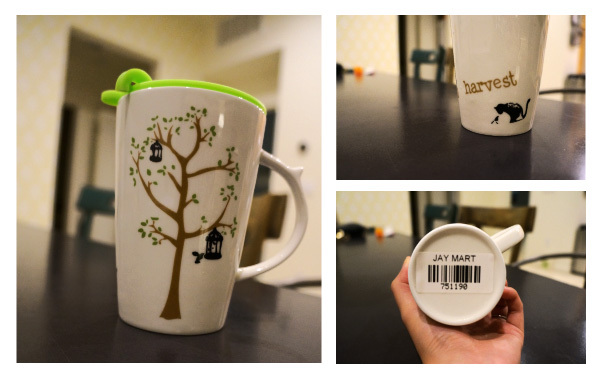 The cup is from Jay Mart (a perfect cup for my blog!). And it has a kitty! The Best Christmas Yet! Chubalee’s first bath! Narnia, Pizza, and Dinner at Dave’s Wedding time! This entry was posted in Life and tagged friends, gift, life. Bookmark the permalink.